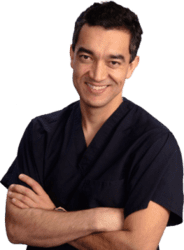 Trust your circumferential body lift (belt lipectomy) procedure to Dr. Julio Clavijo-Alvarez in Pittsburgh, PA, the best-reviewed plastic surgeon. Circumferential body lift, also known as a belt lipectomy, is a procedure design to remove excess skin from the abdomen, love handles and upper buttock area after massive weight loss. It is a procedure designed to address these issues. The surgery is performed under general anesthesia and it is usually completed in 5 hours. The usual recovery time is two weeks. What is Circumferential Body Lift (Belt Lipectomy)? Circumferential Body Lift also known as Belt Lipectomy is the removal of excess fat and skin to the abdomen, love handles, and upper buttock area. Looking for a circumferential body lift (belt lipectomy) surgeon near Pittsburgh, PA or Wexford, PA? Dr. Clavijo at ReNova Plastic Surgery will enhance your lower body with a circumferential lift procedure. The average price near Pittsburgh ranges from $8,000 to $12,500. The circumferential body lift is done in an accredited AAAASF and state certified facility. It is done under general anesthesia. The duration of the procedure is about 4 to 5 hours. It is done as an inpatient procedure. The answer is yes and no. When doing your circumferential body lift we will use absorbable stitches. However, the stitches holding the drains will need to be removed at the time of the drain removal. How is the recovery after a body lift procedure? The typical cost for Circumferential Body lift near Pittsburgh, Pennsylvania ranges from $8,000 - $12,500.